Through collaborations with the three quartets BL!NDMAN [drums], BL!NDMAN [strings] and BL!NDMAN [vox], the master quartet BL!NDMAN [sax] shares 20 years of performing experience with the oncoming wave of young musicians and makes it possible for the two generations to exchange ideas. In 1988 Eric Sleichim founds BL!NDMAN, a saxophone quartet with a traditional line-up, which develops new performance techniques and substantially expands the repertoire for the instrument by continually exploring the boundaries with other disciplines. From the very beginning, the quartet organises workshops and masterclasses for young musicians. The wish for a more structural collaboration between quartets of different generations, results in becoming a collective of 4 quartets. 20 years of stage experience accumulated by the original quartet �– BL!NDMAN [sax] �– is shared with three young quartets: BL!NDMAN [drums], BL!NDMAN [vox] and BL!NDMAN [strings]. 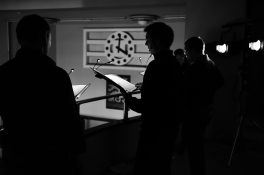 The BL!NDMAN-quartets perform separately as well as in different combinations and formations. All four feature together in the Kwadratur-Triptych, parts of which have been presented at deSingel Antwerp (B), Concertgebouw Brugge (B), Kaaitheater Brussel (B), C-Mine Genk (B) Mousonturm Frankfurt (D), Le Lieu Unique Nantes (F), Muziekgebouw aan �‘t Ij Amsterdam (NL). During the Ars Musica-festival 2011 BL!NDMAN [vox] performs David Lang�’s The Little Match Girl Passion and Heiner Goebbels�’ Worstward Ho. Eric Sleichim and BL!NDMAN win international acclaim with their multidisciplinary approach and from the very start receive assignments from the dance and theatre world, develop multimedia performances , provide live music for several silent movies and are asked to develop programs for several specific occasions. On the occasion of the opening of the new Museum aan de Stroom (MAS) in Antwerp, BL!NDMAN presents the location-project The Raft of the Medusa (2010). Together with BL!NDMAN [sax] and Cristina Zavalloni, BL!NDMAN [vox] creates Eric Sleichim�’s opera/performance Utopia :: 47 �– a very last Passion at the Holland Festival (2011). At the turn of the 21st century, Eric Sleichim concentrates on early music. In 1999 he arranged Bach�’s Choral Partitas for organ into a renewing score for saxophones. BL!NDMAN plays Bach becomes an instant success. Since that time, BL!NDMAN keeps presenting early music in an experimental manner. In 2007 and 2008 BL!NDMAN [sax] + [vox] presents BL!NDMAN plays Buxtehude and Secret Masses. 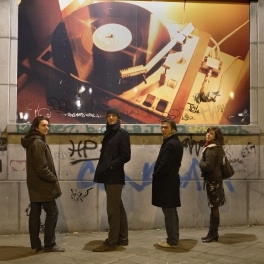 In the framework of a residency at Brigittines in Brussels BL!NDMAN [vox] conceives Turntables 4 Voices, a program for vocal quartet and turntables.